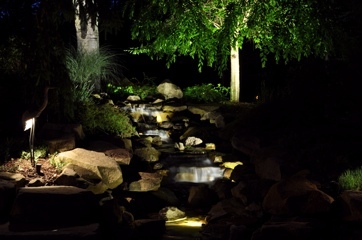 A water feature is any indoor or outdoor element that incorporates water in some form. From a small tabletop fountain, container water garden, fish and koi pond to a large commercial lake or retention pond. Our professionally designed and engineered features can be gravity fed in certain instances or we will evaluate and install a efficiency driven pump to recirculate the water throughout the feature. One of our most popular forms of a water feature is the “pondless” water feature. Simply put it is a man made waterfall that recirculates itself through it’s own reservoir. Pondless water features are very safe for children because there is no actual pool of water that can be a hazard. Pondless water features also are much easier to maintain and have the ability to fit in almost any space you can dream.